WASHINGTON, D.C. -- As the list of major U.S. retailers hit by credit card hackers continues to grow this year, Americans are more likely to worry about having credit card information they used in stores stolen by computer hackers than any other crime they are asked about. Sixty-nine percent of Americans report they frequently or occasionally worry about this happening to them. Having a computer or smartphone hacked (62%) is the only other crime that worries the majority of Americans. 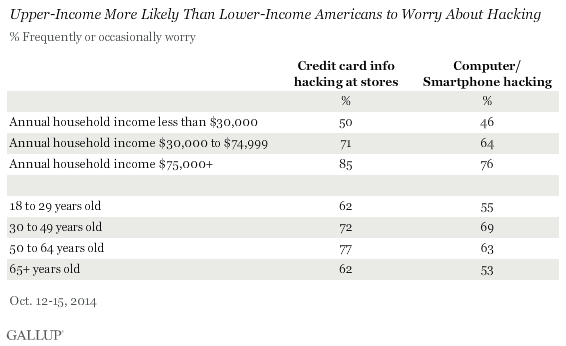 Americans today are more worried about their credit card information being hacked from stores than about any other crimes they are asked about, and a relatively high percentage say they have been victims of this hacking. Many high-profile and popular stores and restaurants have had major hacking problems in 2013 and 2014, something that no doubt has helped kindle such fears. With credit card hacking clearly a concern to many Americans, it may affect their shopping habits as they take measures to protect their identities and finances. Consumers may avoid stores that have been hacked, and begin paying more frequently with cash or prepaid cards to protect their identities. To protect their customers and themselves, some credit card companies are switching to security chips, which are more secure than the magnetic strips currently common in the U.S., and are cautioning customers to check their accounts for suspicious activity. Results for this Gallup poll are based on telephone interviews conducted Oct. 12-15, 2014, with a random sample of 1,017 adults, aged 18 and older, living in all 50 U.S. states and the District of Columbia. Residents of the McAllen, Texas, area felt the least safe walking alone at night (48.5%), in 2012-2013. Residents of the community were also the least likely to say they did not struggle to pay for housing in the last 12 months (75.5%).